This is the key and driving force behind the art I create. To be creative, is to exert one’s mental or physical powers, often under difficult circumstances and at times, to the point of exhaustion. You need to satisfy yourself and your audience, even if you are a self taught artist, constantly adapting to new styles and ideas….. I started to draw architectural design for residential homes, unofficially, when I was 5 years old. At the age of ten I had already mastered pastel portraits of family and friends although I had no official training or art education as an artist. 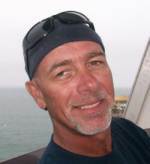 At the age of 36, I decided to follow my dream and immigrate to the United States of America. 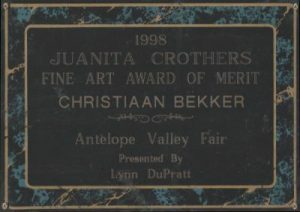 I located to California where I was awarded the Juanita Crothers Fine Art Award in 1998. My talent, however, is not just limited to oil paintings and I have also success with drawing cartoons and custom airbrush. In 2003, I converted to palette knives because the paint brushes did not provide me enough freedom to create my art and as a result, a new art style was born! In 2012 I was commissioned by University of Alabama to create two 5′ x 6′ original paintings destined for the Bryant Conference Center. Furthermore, I ship my art across the USA and to other parts of the world. My art can be seen in countries like the USA, South Africa, New Zealand, Germany, Canada, Australia, Japan and the UK. The pieces are not only available in original artworks but also in limited edition prints. I have three children and four grandchildren. Today, I am traveling America with my beautiful wife, Stephanie.